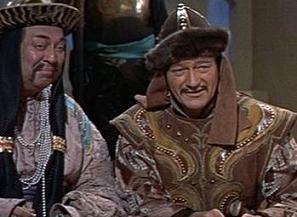 The Conqueror: Featuring John Wayne as Genghis Khan, pilgrim. "And Nicolas Cage... as... Fu Manchu!" We've all seen it. Sometimes, when watching a movie or TV show, you see an actor portraying a character and you can't help wondering how the hell they wound up in that role and/or entire production. "What the Hell, Casting Agency?" happens when you know quite well who the actor is - you just can't understand why they're in this. This can range from really bad to completely awesome, depending on the actor, the part, and the production. On the bad end, an actor might be horribly miscast for the role, or out of place in the entire show/movie. When done right, that dissonance can make the character or the whole production a lot better than could be expected without them. They might even do far better in the role than expected. There is certainly a lot of possibility for So Bad, It's Good as well. This is, naturally, a subjective thing. What will make one person sit back and say "Why did no one stop this?" might make perfect sense to someone else. Sometimes the result of Fake Nationality, Not Even Bothering with the Accent or a combination of the two. Race Lift and Dawson Casting are also sometimes factors. In live-action media this may lead to cases of Hollywood Genetics. Not to be confused with Money, Dear Boy (though that's often the cause of this); sometimes, the actors involved just did it for the heck of it and not necessarily because they were paid very much or that they're trying to show that they can be versatile and not be in the Typecasting trap; which can be bad for actors. Which makes for a great work but still does nothing to reduce the surreality of their presence in it. Can also occur when an attempt at Stunt Casting comes waaaaay out of left-field. But there are cases where the odd casting actually worked And the Fandom Rejoiced. See also: Black Sheep Hit, a hit song that doesn't sound anything like the band's other songs and Playing Against Type, when an actor or director makes a project outside of their usual character type. No examples, please. This only defines the term. What The Hell, Costuming Department?